Wash and slice the bitter gourd lengthwise. If the bitter gourd is big, then cut it into two and then slice it lengthwise carefully. Do not remove the seeds unless it is too hard. Add all the above ingredients except oil. Mix everything together gently. Sprinkle little water, if necessary, and ensure bitter gourd is coated well with the ingredients. Keep this aside for 5 minutes. Heat little oil in a kadai. When it is hot, drop the pieces separately. Fry it in medium flame until they become golden brown and crispy. 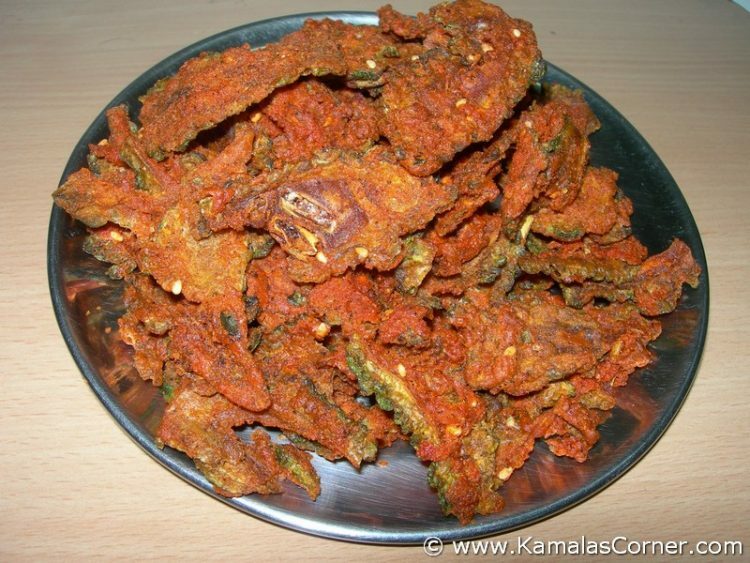 hi kamala mam,I was looking for this recipe for so long.thanks for posting it.I have small doubt,Can i substitute frozen pavakai for this fry?Bcos i do not get the fresh one where i live.will it be crisp?and also please can u tell me some ways of getting rid of bitterness(to some extent,bcos frozen one tend to be more bitter)? You can use frozen one. Wash the frozen bittergourd pieces under running water and spread it in a clean paper towel. Allow to dry under shade. Then add the masala powders as above and try. thanks for the prompt reply.will try soon.Each and every recipe that i try from your site WILL be a success. My husband is from TN and he likes traditional ways of cooking it which i don't know well,But now its a different case.Thanks very much for posting very healthy and traditional recipes.Mam,a small suggestion,adding "Kids corner" to ur site will be good.so that we can make our kids eat lots of healthy food.I have daughter(2yrs),refuses to eat lot of things.is there anything like sathumavu or something like that ,that can be prepared at home?? Do we need to add water before putting into oil or will the lemon juice itself is sufficient. Today I will try this. U r so kind like my mom. Thank u kamala mam. Mostly, when you wash the bittergourd and cut, the water content in the vegetable along with lemon juice is sufficient. If you feel it is too dry and not binding, then just sprinkle little water and mix it well. If you add more water, then it will not be crisp when fried.